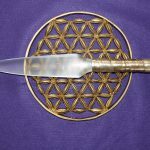 Tom has been making Selenite Swords of Light for the last 11 years and along the way has branched out to create other Ascension tools that will be of benefit to light workers around the planet. Tom’s mission is to magnify the love, light, and grace of light workers so that they may bring love and light into the planet in a very powerful way. The Selenite Swords of Light does this work with great efficiency. At this time, it is especially important that all the light workers on the planet function at a high degree of purity and efficiency. When we look around the planet, we see much work that needs to be done and many corrections that need to take place to bring harmony, peace, and more light to the planet. The Selenite Swords of Light because of their ability to magnify all the energies that are placed on them many folds, they are the ideal tool to assist mankind in moving to the next dimension of love and light. Over the years every batch of new swords that Tom has made has become more powerful holding more light and love and projecting higher multidimensional dimensional frequencies and aspects into the world. The Selenite Swords of Light can assist you in connecting into the higher dimensions of love, light, and grace in all the levels of consciousness and planes of existence. How this is accomplished is very interesting subject. 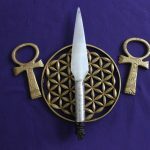 The ingredients that are inside of the Selenite Swords of Light create a synergetic effect that multiplies all of the individual energies that are in each sword. The blade of each sword is made of pure Selenite which comes from Morocco, and within the handle of each sword is a mixture of power crystals, temple energies, and crystals from other sacred sites around the world. There are over 400 crystals that are crushed into a powder and mixed with additional Selenite powder. The Selenite powder adds a multiplication and broadcast capability to the material that is in the handle. Also, within the handle is a 1 ml bottle of sacred waters from over 35 locations around the planet: waters from Mother Mary’s spring, sacred wells of England and Ireland, Mount Shasta Mount Fuji the Tippon water Temple in Peru the Amazon River, Lake Titicaca, and more. One other additional ingredient in the swords is that around the handle of each sword are over 350 pictures of ascended Masters and Angelic beings, sacred geometry forms, the Keys of Enoch, Lemurian, art, Lemurian tones, sacred symbols and all colors, plus many others. Each Selenite Sword of Light is individually Hand Mastered. 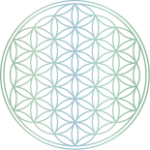 Tom says “I wanted to share with you a download I recently received as I worked with one of the newest Selenite Swords of Light that I have made. What came in was a discourse concerning how the Selenite Swords of Light actually works. As I mentioned inside each sword is a bottle of sacred water from sacred sites around the world, this bottle has two powerful magnets on each end and is connected by a twisted copper wire. This configuration of the sacred water being surrounded by this magnetic field creates an electric current running around and through the water. Researchers have found water has a tremendous ability to hold information and sacred water is holding sacred information from around the world. Combining the electrical magnetic field in the handle moving through the connection grid which is the Selenite powder and all the other power crystals creates an immense and significant synergetic effect”. Computers use quartz to store and transmit information in a computer. What Tom received was that the sacred water is creating a sacred computer that is connected to the crystals that are inside of the handle and then it is projected through the blade of the sword. Selenite has a property that it magnifies whatever is placed upon it, and what Tom received is that Selenite connects all the other crystals into a living consciousness and intelligence that is interphased to this powerful computer that is multidimensional and has unlimited capability. The interface to this powerful device is through our intentions, thoughts, and the connection of our hand placed on the handle. This connection of our hand sends an actual current love, light, grace, color, and sound into the handle to turn on and activate the Selenite Sword of Light. 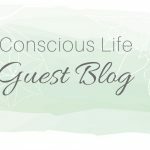 This is a thought-activated sacred interdimensional computer that can perform any task or assist in any Activation or Ceremony that you may want to do or work with specific energies that you would like to work with. The crystal that is placed at the handle end of the sword brings about a deeper connection between the sword and its owner, plus adds a flavor and an effect that can be specifically structured for a linage or council of light from the future or past. So don’t hold back with your goals. Request of the divine and expand whatever your mission and puzzle piece is. Let the Selenite Sword of Light assist you with what you would like to accomplish and in whatever your mission is because inside the Sword of Light is your sacred water computer that will produce sacred manifestations for you. The Selenite Swords of Light that Tom creates are living beings that have a tremendous intelligence and want to assist you in your work! So, have fun and change the world. Your light and love is greatly needed. Magnify it with Selenite Swords of Light. Conscious Life Events are proud to be presenting Tom Ledder workshops on the Sunshine Coast in November.